The staging of pancreatic cancer can determine several factors such as whether the cancer is operable and the overall prognosis of a patient. The stage of a cancer is a term used to describe its size and how far it has spread within the body. It provides doctors a way to systematically assess how far advanced the cancer is for each individual patient, so that the most suitable treatment options may be considered. In Australia, pancreatic cancer is staged using a widely used and internationally recognised system called the TNM. This system looks at three important disease parameters – Tumour (T), Lymph Nodes (N) and Metastasis (M) – which medical research has shown to be reproducible indicators of cancer disease progression. The information from each are then combined to give an overall stage number, which may be further divided alphabetically. A comparison to everyday items for different tumour sizes. This is the earliest cancer stage. The cancer is microscopic and can only be detected if pancreatic tissue is removed and sent for pathologic testing. There are no symptoms. This category is rarely used in practice, and is important mainly in cancer research. The cancer is small and growth remains completely within the pancreas. There is no spread. There may be symptoms depending on whether the cancer is obstructing the flow of bile from the gallbladder as it drains through the pancreas into the small bowel. The cancer is now a significant size with a potential to spread. It has either overgrown the pancreas and started invading surrounding tissue, or has spread to nearby lymph nodes, or both. The cancer is spreading more deeply into tissue surround the pancreas, and is involving important blood vessels of the stomach and gut in the vicinity. The cancer has now spread to other organs or to bone. Source: Exocrine Pancreas. 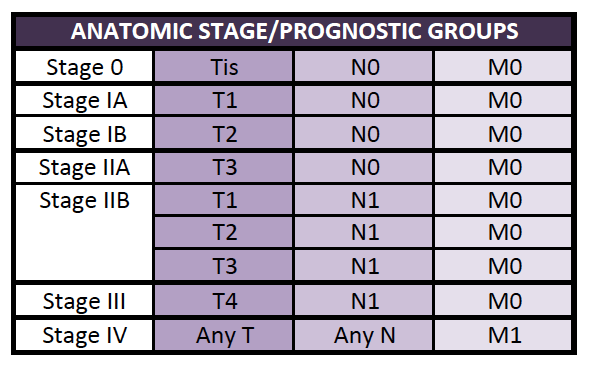 AJCC Cancer Staging Manual. 7th ed. New York, NY: Springer; 2009.